The ultimate team building boxing experience. CorporateBOX™ by Total Boxer® is the ultimate boxing training experience day for your team, department or whole company. Delivered at our fully equipped, two floor boxing and gym facility in North London, CorporateBOX™ is team building, morale boosting, seriously challenging and lots of fun! Whether it’s pre-season training for your team, or an engaging work-out your company can enjoy, professional Total Boxer® coaches can deliver from our world famous classes including Get FIT Not HIT®, HIIB®, BoxingYoga™ and Strongman. CorporateBOX™ can be designed as a bespoke package according to your requirements, with up to 100 participants in one or all of our classes, from 2 hours to a whole day, with additional options including use of kitchen facilities, conference room and more. All training equipment is provided as standard, as well as unlimited bottled water, separate male/female toilets and showers, ample on site parking and WiFi. We’re also easily accessed by bus and train. Additional options include use of a lounge, kitchen and meeting room with projector, screen and flip charts. Catering is not provided but food can be brought in or ordered from local restaurants with discounts available at some of our local favourites, including 20% off food at Monkey Nuts in Crouch End. "The Total Boxer team really put us through our paces during our Get Fit Not Hit and BoxingYoga sessions. 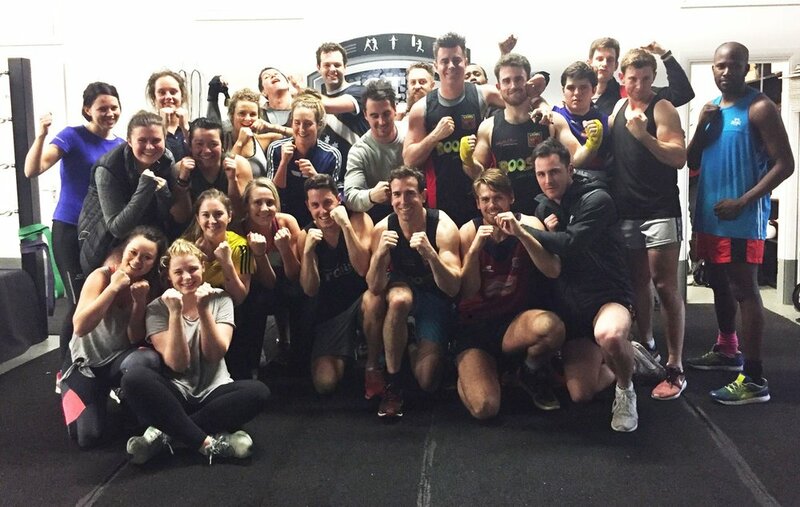 Members of our AFL Men’s and Women’s teams felt the benefits after the very first session. It’s a great set-up and we can’t wait to get back down again for another session. We totally recommend getting involved." "The feedback from the team was highly positive and glowing of Total Boxer. All were made to feel welcome and anxieties were put to bed very early on. The varying levels of fitness were not an issue and the event was paced to everyone’s liking and taste." "CorporateBox was the perfect mix for our team and clients. Matt and Bobby ran a great session teaching us the techniques of the ‘sweet science’ in a fun and engaging way. The session was challenging, as they put us through our paces, but really rewarding! We will be back again and would recommend it to others." Contact us today so we can design the perfect CorporateBOX™ experience for your team. Complete the form below or call us on +44 (0)333 1234506. Please tell us more about your requirements or if you have any questions.